Legislator Toney L. Earl is sworn in as Chairman of the Rockland County Legislature. His wife, Idette, and grandson, Weldon McWilliams V, joined him at the podium. PRESS RELEASE – Toney L. Earl will serve as Chair of the Rockland County Legislature for its 2017 session. Earl (D-Hillcrest) was selected in a unanimous 13-0 vote Wednesday night. “I am so honored by the confidence my colleagues have placed in me by choosing me to serve as Chairman,” Earl said. “It is a role I take with great responsibility and a promise to do the best I can every day for the people of our great County. Legislator Nancy Low-Hogan is sworn in as Vice Chair of the Rockland County Legislature by County Clerk Paul Piperato. Her husband, Michael Hogan, joined her at the podium. Legislator Nancy Low-Hogan (D-South Nyack) was unanimously selected Vice Chair. 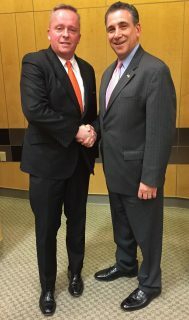 Legislator Vincent D. Tyer (left) was named Deputy Minority Leader by Legislator Lon M. Hofstein after Hofstein was elected Minority Leader. “I would like to thank all of my colleagues for putting their trust in me to take on this leadership role as vice chairwoman,” Low-Hogan said. Also tonight, Democrats voted 9-0 to elect Legislator Aney Paul (D-Nanuet) as majority leader. She named Legislator Alden H. Wolfe (D-Montebello) as deputy majority leader; he just completed a three-year tenure as chair. Republicans voted 4-0 to elect Legislator Lon M. Hofstein (R-New City) as minority leader. He named Legislator Vincent D. Tyer (R-Pearl River) as his deputy. Earl has served on the Legislature since 2010. He was deputy majority Leader for three years until being elected majority Leader last year. Earl is a former Health and Safety director for New York City Transport Workers Union Local 100 and a very active member of the First Baptist Church in Spring Valley. His public service includes being an executive member of the NAACP, Spring Valley Chapter; membership in Masonic Lodge Empire No. 5; chairing the funding projects committee at Mother Hale House; and chairing the College Scholarship Committee of the New York City Society of African American Employees. He coached Spring Valley Babe Ruth Baseball, girls’ soccer and softball. In his speech nominating Earl, Legislator Ilan Schoenberger (D-Wesley Hills) said, “Toney’s soft-spoken and composed manner helps calm our sometimes-heated debates here in the Legislature, and his unique perspective contributes greatly to our grasp of the issues. “Toney is always worried about the little guy and gal – and making sure their voices are heard and their needs are addressed as much as anyone else’s,” Schoenberger said. Low-Hogan has served on the Legislature since 2012. She is currently Executive Director of the Rockland County Bar Association, and holds a bachelor’s degree in criminal justice from the University of Delaware. In fact, she has a lifelong love of education, earning a master’s degree in college student development from Seton Hall University and a Ph.D. in higher education from New York University. Her many years of public service include more than a decade of membership on the board of directors of the Association for the Visually Impaired, including three years as its chair. She is also the Legislature’s liaison to Big Brothers-Big Sisters of Rockland County, and a graduate of Leadership Rockland, Inc, where she voluntarily served on two of the organization’s planning committees. Cornell recalled when she first got to know Low-Hogan and how Low-Hogan backed the new Rockland Learning Collaborative by allowing its adult students the use of facilities at LIU’s local campus shortly after she became Associate Provost in charge of the campus. She also noted Low-Hogan’s important role in convincing state officials to move the shared-use path – part of the new bridge plans – away from the residential streets of South Nyack. Legislators Aron B. Wieder (D-Spring Valley), Patrick Moroney (R-Pearl River) Charles Falciglia (R-Suffern) and Doug Jobson (R-Stony Point) were absent.